Fox News/TwitterRon Colburn, a former Border Patrol deputy who is now president of the Border Patrol Foundation. 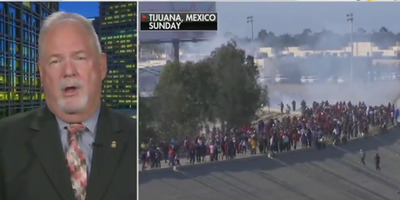 Ron Colburn, the president of the Border Patrol Foundation, has defended the use of tear gas on migrants at the US-Mexico border. Videos and photos posted to social media on Sunday showed US border authorities firing tear gas at migrants at the border near San Ysidro, California. Ron Colburn, a former Border Patrol deputy who is now president of the nonprofit Border Patrol Foundation, said using tear gas against the migrants on Sunday was “absolutely” warranted. Oleoresin capsicum spray, also known as OC pepper spray, contains an oily resin derived from chilli peppers at a high concentration, according to Medical News Today. A report from the International Network of Civil Liberties Organisations and Physicians for Human Rights found that OC sprays might contain toxic chemicals that make their side effects harder to treat. Colburn wasn’t questioned about his claim, as Doocy continued to speak about the tear gas. “It looks like [Mexican officials] are trying to review videotape and figure out who some of these people were who stormed the border and they’re going to deport them back to their country of origin,” Doocy said. The migrants attempting to enter the United States are members of the so-called migrant caravan, which President Donald Trump criticised in the weeks leading up to the US midterm elections. Though Colburn specifically mentioned nachos, a Mexican dish,the caravan consists mostly of people from Guatemala, Honduras, and El Salvador. Trump has sent thousands of US troops to the border in an attempt to block the migrants from entering the United States to claim asylum. Videos and photos posted to social media on Sunday showed US border authorities firing tear gas at members of the migrant caravan after the group left a makeshift shelter in Tijuana to head for San Ysidro, the largest port of entry on the southern US border.